Windows Services are applications that run in the background and perform various tasks. The applications do not have a user interface or produce any visual output. Windows Services are started automatically when computer is booted. They do not require a logged in user in order to execute and can run under the context of any user including the system. Windows Services are controlled through the Service Control Manager where they can be stopped, paused, and started as needed. 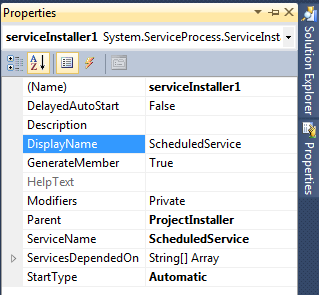 In Solution explorer select Service1.cs file and change Service1.cs name to ScheduledService.cs because in this project I am using this name if you want to use another name for your service you should give your required name. 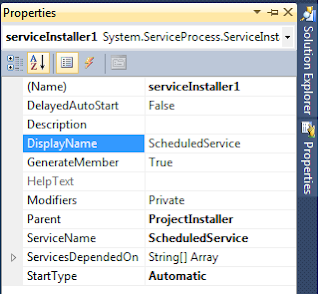 After change Name and ServiceName properties again open ScheduledService.cs in design view and right click on it to Add Installer files to our application. The main purpose of using Windows Installer is an installation and configuration service provided with Windows. The installer service enables customers to provide better corporate deployment and provides a standard format for component management. After completion of setting all the properties now we need to write the code to run the windows services at scheduled intervals. After completion code writing build the application and install windows service. To install windows service check this post here I explained clearly how to install windows service and how to start windows service. Now the service is installed. To start and stop the service, go to Control Panel --> Administrative Tools --> Services. Right click the service and select Start. Now the service is started, and you will be able to see entries in the log file we defined in the code. 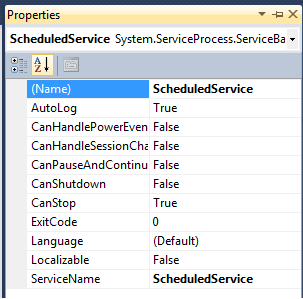 can we schedule our application daily on specific time using win services. so w.r.t to your above code done i need to write the same code in OnElapsedTime or is it fine if its just in onstart method(since after every 5 min the service starts from onstart method? Please Answer this if you know My requirement is like this " I have folder in System when images copied into that folder that images names automatically inserted into database. How can I do th is? Thank you. really nice article. Great post. Very interesting to see. I usually do not read blog, but this post definatelly caught my attention. Nice work, is there a way to log as user, giving the username and password. hi suresh sir, this is very easy to learn to newer. very nice explanation. gr8 Suresh... ths article really helped me a lot..
hey iam using windows service to insert record from one to another table on particular interval but it eats lots of memory when i run ths service under services.msc... any solution to flush the memory used by ths service.Thanks! Hi, This tutorial is relay helpful. But I want to read data from access DB using timer. I write code in OnElapsedTime() and also try onStart() but still got error. It was "the service on local computer started and then stopped. some services stop automatically...". Please tell me what's the problem. I clear my log file also and googling lot of blogs. Please help me. I want to set timer for 30 mins to complete online test. to make it available to clients over the network. It works fine when the server is made as a console application, but doesn't work when the server is made as a Windows service. Please advise. 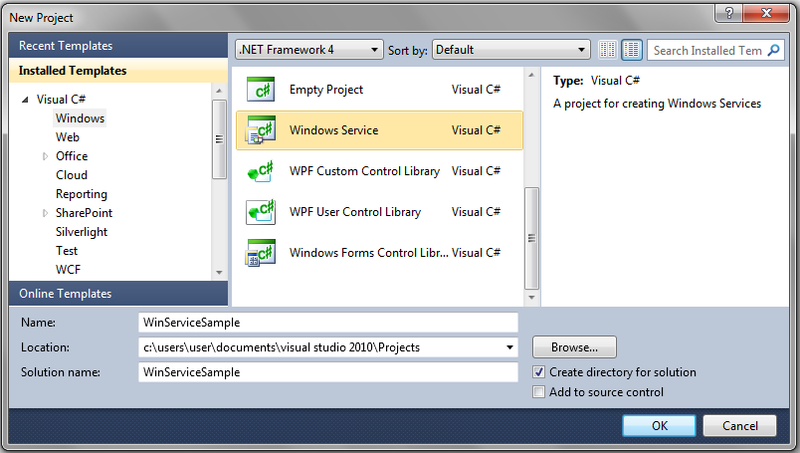 The Windows service runs as LocalSystem, was created in Visual Studio 2012. Firewall has been disabled. Very Nice and Impressive artical for begginers. Now, I want to execute the stored procedure for every 5minutes which have the one out put parameter. So that where i need the call the procedure from the above code. i created one GUI application, now i want that application run as windows service.. meaning it should start when system is started , how to make my application run as i told above?? Very useful , your site willing to learn new stuff. Thank you. my requirement is: create windows service to run daily ONCE c#, fetch records from DB and export records to excel and send email that excel as a attachment. Please do the needful. Could u please explain how to debug window service by step by step. It was a wonderful tutorial. I had just one problem. Service couldn't write to text file. 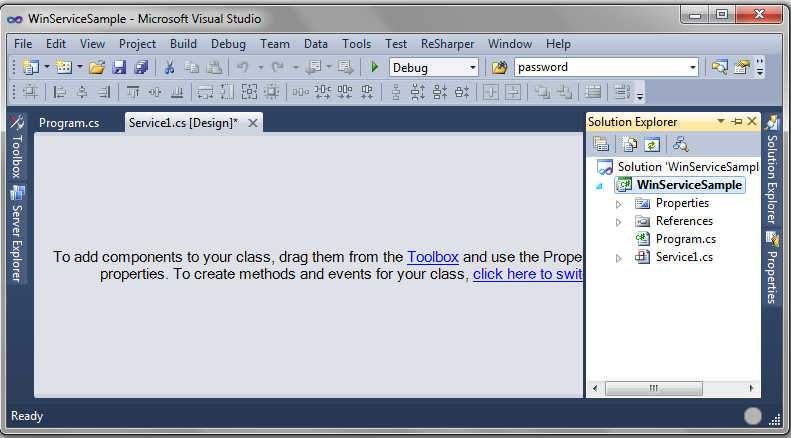 Although same code worked in Windows Form Application. Please help me out. I am getting Bad image format exception at the time of installation what i have to do pls help me..
Error 1067: the process terminated Unexpectedly." sir whats gone wrong ? Hi Suresh...Nice article....I want to ask can we use this for ASP.NET application? Means I want to ask that consider a web page or application that is using windows service for printing tasks.. Currently i do have a requirement to develop a console based windows application which will check the status of all scheduled jobs scheduled in windows task scheduler and based on the job status it will fire email . Anyone have any idea on this please. 1.Need to schedule a job in remote machine.Get all scheduled jobs in windows task scheduler and check the status of them. Any suggestion on this please. can you tell me how to send email automatically in windows application based on the date specified in database. Thanks you very much suresh.You article helped me to create a service easily and quickly.Keep it up. hi suresh is there any method in .net start ,stop ,restart services in system tray . Sir, This is Abhinav Singh 993 , Sir, whenever I am in problem I just view your website and my problem gets solved. 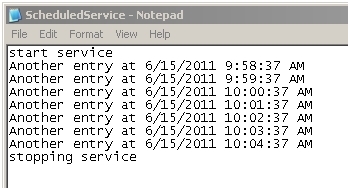 by reading the time from the database based on the time value the windows service has to run. how to do can u please help me? Hi sir I have one requirement. Actually I have one requirement. in database there is one table called device table.there is one column called flag. I will have to create one windows service which will be monitoring the table ,the work for the service will be if the flag is false for 1 hour then it will turn it to true. in a window service there is a function with try catch and i want that if exception generates than the value should be save into the database so plz guide me. because in exception part function is not called. can i call a method in exception part in window service???? please tell me, how to call windows service on hosting site or is it possible or not. i need help on windows 8 app development please start a section on windows store app development using c# . this is really nice article thank you very much for your help. now i want execute this service on every day at 8 am only so is it possible ?? Can You tell me how to write a public and my ownmethod in service/cs and how to call it. Such a wonderful article about windows service. good article it helped me lot. i just wanted to know is it possible to link window services to other application. for ex., i have one tool which is done in C# window application which execute testing scripts. i want to capture of the time of start time script execution, failed time of script and end time of script. can you please suggest me on this. This article helps me a lot to develop custom services. Nice article. Useful for all beginners to develop their custom services. thank you sir to giving me solution by this article. How I can write a windows service so it will call my URL and runs it. 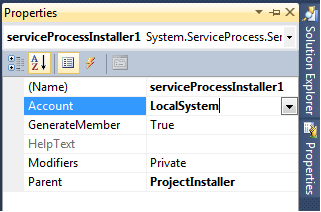 How I can write a windows service so it will show latest inserted row in my database..?